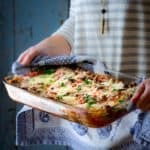 I’m going to get to this Healthy Beef Lasagna with Spinach and Basil in a minute, and tell you all about how it is only 259 calories per serving (which is about 77 calories less than most lasagna recipes.) I’m going to get to how there is a gluten-free variation that is arguably better than the whole-wheat version. And about how it’s layered with healthy satisfying vegetables and lean grass fed beef and fresh basil…. Hang on to that thought because, I want to talk about shopping for a sec. More specifically, shopping at Marshalls. There’s this thing that happens to me when I shop there, and am wondering if it happens to you too. Please tell me I am not alone. Let me explain. When I shop there, I either buy nothing at all. Or a wholecartloadofthings. Like once I take one item, and put it into my cart the floodgates are open and suddenly the whole cart is full in a matter of minutes. So, that moment when I decide to buy one item, I call that breaking the seal. Does that happen to you? 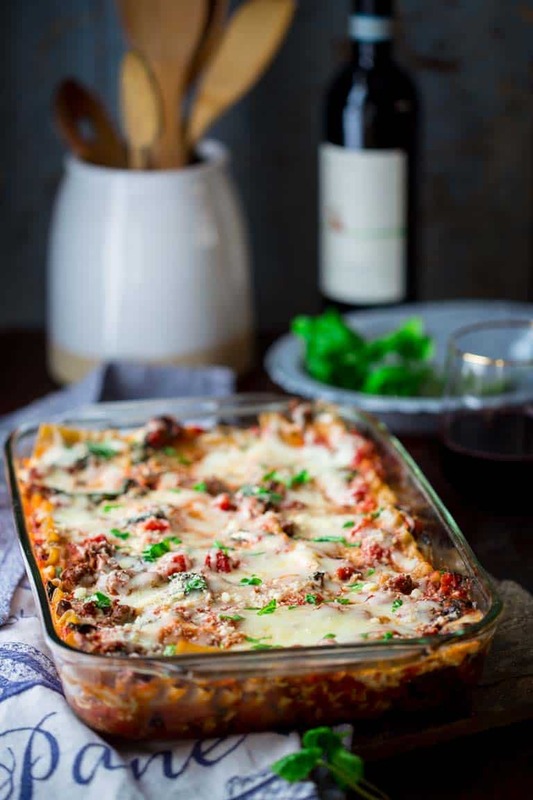 Well, I was reminded of that sensation, of breaking the seal, this morning as I was writing this post because I have long resisted sharing a lasagna recipe here on the blog. And not sharing one, is a whole lot like shopping at Marshalls with an empty cart. And now I have broken the seal. My first item is in the cart. And by item, I am talking about Lasagna. And now that I have shared one lasagna, I want to make a billion different variations of lasagna for you guys! Side note: A very similar thing happened after I resisted then shared my first pie here in 2014, and then quickly followed it up with pie after pie. Broken seal. Boom! Full cart. Ok, moving on. 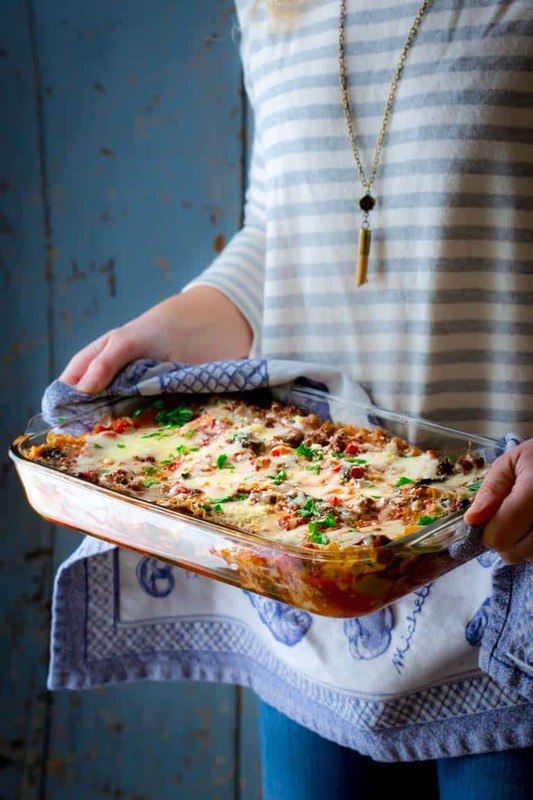 Let’s talk about how to make this Healthy Beef and Spinach Lasagna with Basil shall we? Gluten-free or whole-wheat lasagna noodles: For this recipe I tested it with whole-wheat lasagna, and I also tested it with gluten-free brown rice lasagna noodles. Either choice worked great, and the cooking and layering technique will not change. What you will notice is that the texture of the rice lasagna is actually on the softer side, and both my husband and I actually preferred it to the wheat version. Tips for texture: To get the best texture, boil the pasta for only 5 minutes before layering it into the lasagna. This will soften it, but it will not be completely mushy by the time it is finished baking. Cut Pasta to Fit: Trim the pasta to make a complete layer. I did this by laying 3 across, and then filled in the bottom (like the foot of the bed) with a horizontal noodle, cut to fit. You don’t want to overlap the noodles because they stick together and become a solid hard mass of noodle which is unpleasant. Beef: I used ground grass-fed beef because it’s a healthier choice and it is better for the environment. See my back to basics tip why to choose grass-fed beef. 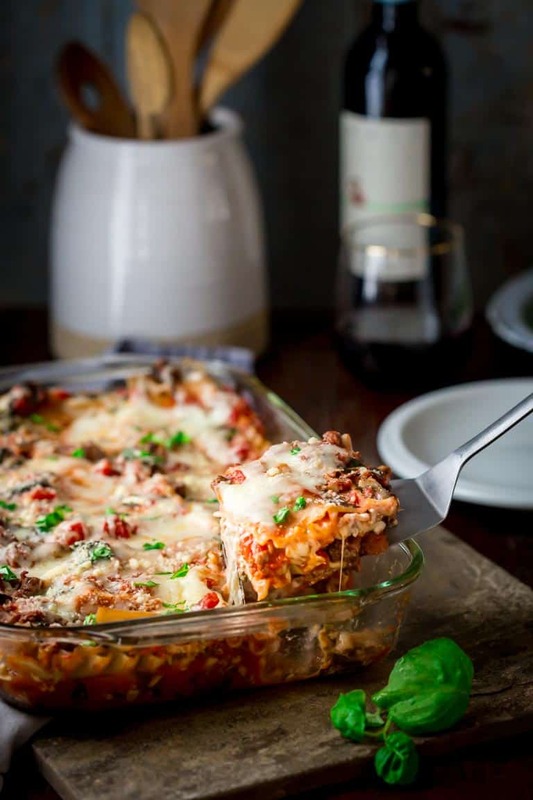 And it has a stronger flavor, which sometimes can be an issue, but in this case is an asset because the lasagna tastes like beef lasagna even though you’re getting less than an ounce per serving. Stealthy Mushrooms: I used 4 ounces of finely chopped mushrooms to bulk up the beef. My daughter who claims to not like mushrooms (I ignore this and feed them to her regularly by the way) didn’t even notice them. The key is chopping them up in to little pieces. The benefit of replacing some of the beef with mushrooms is that it gives volume with very few calories. Plus mushrooms are loaded with vitamins and antioxidants. Lower Fat Cheese: I used part-skim ricotta and part-skim mozzarella to save on calories. I found that shredding the part-skim mozzarella by hand yielded a better texture on the top of the casserole than using pre-shredded bagged mozzarella. If you do want to use bagged mozzarella, just be careful in step 6 after you add on the last layer of cheese. You don’t want it to get brown at all. Since the cheese is lower in fat, it can get hard if you brown it. Basil: I added in basil for freshness and flavor. This is the key to the yumminess of this lasagna. Don’t skimp on it. I used a half cup of chopped fresh basil. It really makes this taste so fresh and yummy. Do you have that breaking the seal experience when shopping? Do you ever use mushrooms to replace beef? Now that I’ve broken the seal, what other kinds of lasagna would you like to see here? 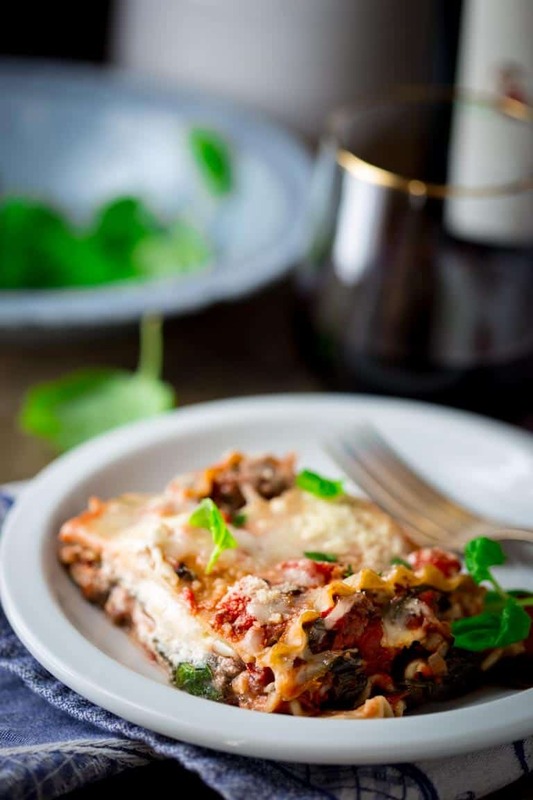 This Healthy Beef Lasagna with Spinach and Basil is only 259 calories per serving which is about 77 calories less than most lasagnas! It’s layered with healthy satisfying vegetables, lean grass fed beef and fresh basil making it the perfect kid-friendly dinner. And there is a gluten free version! Preheat oven to 350 degrees F. Coat a 9 by 13-inch baking dish with cooking spray. Bring a large pot of lightly salted water to a boil. Cook lasagna, stirring occasionally until soft and pliable but not yet al dente, about 5 minutes. Drain and rinse with cold water. Meanwhile, coat a large non-stick skillet with cooking spray. Add beef, mushrooms and Italian Seasoning and set over medium-high heat. Cook, breaking up beef with a wooden spoon until no-longer pink and the liquid is evaporated, 7 to 8 minutes. Add garlic and cook, stirring 30 seconds. Add tomatoes and salt and stir to combine. Bring to a simmer, while adding baby spinach by handfuls, stirring to wilt until the whole amount is completely wilted into the beef mixture, 3 to 4 minutes. Remove from the heat and stir in basil. Beat egg in a medium bowl. Add ricotta and pepper and stir until completely combined. Spread ½ cup tomato mixture in the bottom of the prepared baking dish. (Tip: Remove any large chunks of beef and add them back to the skillet of sauce.) Layer three lasagna noodles vertically into the baking dish; cut one more noodle as necessary and place horizontally to fill in the space at the end of the other three. Top with 1 ½ cups tomato mixture. Dot with half of the ricotta mixture. Sprinkle with ¾ cup mozzarella. Top with 3 ½ more noodles, 1 ½ cups tomato mixture. Dot with the remaining half of the ricotta mixture and top with ¾ cup mozzarella. Top with the remaining noodles. Spread the remaining tomato mixture (about 1 cup) evenly over the top. Cover with aluminum foil. Bake until the lasagna is steaming hot all the way through, 40 to 50 minutes. Remove foil, sprinkle with the remaining ½ cup mozzarella and Parmesan. Bake until the mozzarella on top is just melted but not browned, about 10 minutes. Let lasagna cool 10 to 15 minutes before sprinkling with additional basil and slicing it into 12 servings. To Make Ahead: Can be prepared through step 5 up to 1 day in advance. Proceed with step 6 adding an extra 15 minutes of cook time before removing foil. This looks and sounds amazing! Love that it’s not as heavy as classic lasagne! And, yes, that happens to me at Marshall’s too!!! Oh, I am so glad I am not alone. Ha ha. Yum this looks amazing! I actually have never really enjoyed lasagna because it is always SO HEAVY!! But looking at this recipe… I think I may just give it a try! I’m not a fan of heavy lasagna either. I don’t really see the point. Thank you for coming by Betty. I was excited to finally come across gluten free lasagna noodles, and more than one brand. So I’m ready for you to fill up my cart with recipes. This one looks yummy. Your photo as always are amazingly beautiful. I like the blue wall…. Ha ha, way to carry the analogy through. Glad I didn’t loose you there. Happy cooking! I am totally with you! Haha. Always my problem (but not really a problem, right?) 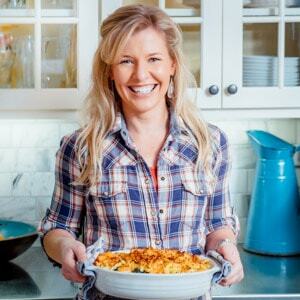 😉 Love the tips for this lasagna and that it can be gluten-free as well! Not when you find a great deal it isn’t! 🙂 Thanks so much Tessa. Have a fantastic weekend. That’s one way of looking at it Beverly. Lol. So glad you came by. Have a good day. SO delicious!! Will be making again and again. Thank you for sharing. I am so glad to hear you loved it! I really appreciate your taking the time to come back and let me know. That means a lot! Thank you. Great Recipe, I only put it in the oven for 30 mins and the last 10 mins to melt the asiago cheese. Loved the recipe!!!! This lasagna looks so delicious and tasty. I would order one piece of it right now. Well, I’m not sure that “ordering” is an option, but the recipe is pretty easy as far as lasagnas go. This sounds so good! I stopped making lasanga because of my pre-wedding diet, but this version is very diet-friendly. Do you have any suggestions for substituting the mushrooms with something else that would also add volume? I think you could easily add shredded veggies to bulk it up. Mushrooms retain their volume pretty well and mimic ground beef nicely so that’s why I used them. I know they’re not for everyone though! My thoughts are that some veggies melt down more than others, so I would shoot for a more fibrous one like parsnips, celeriac or turnips. Zucchini, while neutral in flavor, is too watery to use this method and would prevent the beef from browning nicely. So if you’re up for it, try 2 to 3 cups of shredded veggies, and see how it goes. You’d never guess this was a healthier lasagna! It was delicious!!! 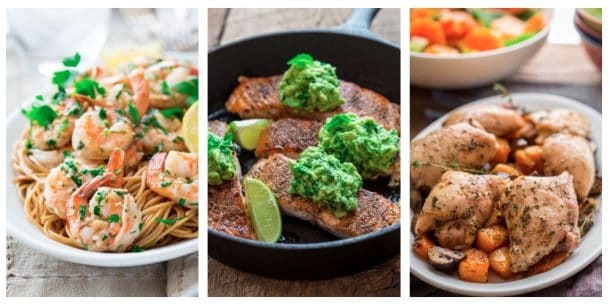 This is epic healthy comfort food! Love that I can use gluten-free brown rice lasagna noodles. Looks so delicious! Italian comfort food has always been a weakness for me. I love this lightened up version – no denial needed! This was wonderful! I wanted to make something out of the ordinary, and this was perfect. I was drawn to this because I make my meatloaf with mushrooms to “stretch” the ground beef. The calorie count on this compared to other recipes makes this an immediate contender. I feel like I got two slices for the price of one!